The vintage-style fully stereo 1974 four band Parametric Equaliser provides exceptional analogue musicality and sonic clarity, taking it's inspiration from 1970's-era gear. It has the ability to perform subtle shaping for mastering purposes that require a delicate touch and easy recall, but is just as capable of tonal sculpting, adding the analogue warmth and character that is near impossible to emulate in the digital domain. Get immersive with the stereo operation, with one set of controls for both channels. The versatile design features dual channel precision stepped potentiometers, providing exceptional accuracy for fast and simple recall. The fully variable bandwidth allows you to control the parametric mid bands, making adjustments as surgically precise or as broad and natural sounding as you could ever require. Fully adjustable low and high cut filters are also included, ideal for tuning out undesirable signals at the frequency extremes. It also features a switchable slope allowing you to alter the focus at the high and low frequencies plus a low peak setting that magnifies the bottom end. The 1974 is perfect for tonal shaping, staying true to the sound of the 70s and ideal for any musician. Genuine Stereo Operation with Indented and Accurate Potentiometers. The genuine stereo linked operation of the 1974 makes adjustment quick and extremely simple using just one set of controls to alter both channels. Gone is the wasted time spent fiddling about on every control trying to match the settings of the left and right channels with each other. The 1974 uses precision potentiometers, each one being matched for left/right accuracy to within fine tolerances by our trained technicians, so that both channels operate identically, and also have indented operation, providing exceptional accuracy for fast and simple recall. Fully Parametric with Totally Variable Bandwidth. The 1974 is a true 'parametric' equaliser, with the four bands having fully variable frequency controls and offer cut and boost of +/-12dB's. 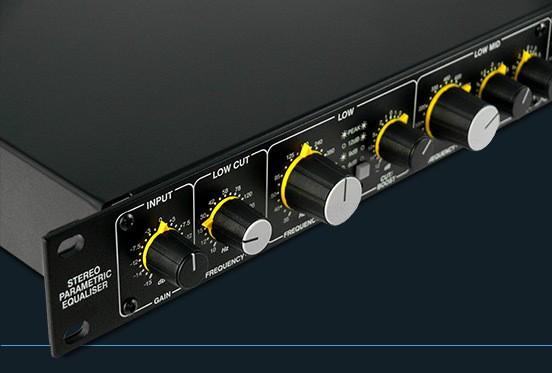 However, unlike EQ's with a no bandwidth adjustment, or a simple switch, the two mid bands have completely variable filter bandwidth controls enabling the user to focus in on very narrow sections of the audio spectrum or apply a broad natural sounding filter, or, of course, anything in between the two. This makes the 1974 incredibly versatile and capable of modifying everything from subtly fine tuning mixes to tone sculpting problematic recordings. Variable Low and High Cut Filters. The 1974 also includes fully variable low and high cut filters, ideal for tuning out undesirable signals. The low cut (otherwise known as High Pass Filter) having a range of 10Hz-225Hz and the high cut (otherwise known as Low Pass Filter) 4kHz-32kHz. The beauty of being fully variable is that, unlike fixed frequency filters, it is easy to sweep both controls to find the perfect setting and remove sounds with pinpoint accuracy. This is especially useful when bracketing individual tracks where it will be necessary to cut the bass to remove rumble and top to remove hiss, as these undesirable signals will just add up as the tracks are layered. For instance, cut everything instrument below 100Hz except those within that spectrum, such as the kick, bass or synths etc to provide extra headroom to work and also tighten up the bass making it sound less muddy. And likewise for the high frequencies. Switchable Slope Setting. Very few analogue parametric equalisers have an adjustable slope on the low and high cut filters, and is yet another feature of the 1974 that allows you to take control of your audio. The filter slopes of the 1974 have been chosen for their musicality - allowing you to adjust the focus of the audio at the bottom and top ends of your recording but not so harsh as to be a very noticeable brick wall filter. At the bottom end slopes of 6, 9 and 12dB per octave plus a Peak setting are available, and at the high end 6 and 12dB's per octave. The Peak setting is quite a unique feature in that it adds a narrow bell shape to the 12dB per octave low cut filter at the knee frequency just before it rolls off. Especially useful on kick drums, it magnifies and gives extra weight to the hit whilst still filtering out any subsonic junk and without muddying the lower mid. It'll give your kick an added sense of power and precision. Vintage-style four band Parametric Equalisation which takes it's inspiration from 1970's-era analogue gear. Delivers classic sonic clarity and control at an affordable price. Indented and accurate potentiometers, providing precision for quick and simple recall. Variable low and high cut filters allow you to perfectly tune out any undesirable signals. Fully variable bandwidth provides absolute control for the parametric mid bands. Switchable slope plus low peak settings allows you to adjust the focus and magnify the bottom end. True hardware bypass for accurate A/B comparisons. What's so good about analogue EQ's? Equaliser plug-ins will get the job done, all be it in a rather sterile manner - if you want to bring out a bassline, they'll bring out a bassline, however what they struggle to do is add the magic that only analogue can bring, even the ones that emulate analogue gear. Look at it like this: is it better to view a print of a Van Gogh painting or the actual painting? The print may have the correct colour reproduction and from a distance may look exact but get in close and it will lack the subtlety and depth of the brush strokes and artistic fluorishes. The same can be said for your recording equipment. That's not to say that plug-ins are all bad, in certain situations the clean, transparent approach may be just what's required, but to add character go for analogue every time.